Kick off your visit on the 8th (Tue): explore the ancient world of Pukara de Quitor, don't miss a visit to Mirador de Kari, Piedra del Coyote, take in the natural beauty of Geyser del Tatio, then browse the eclectic array of goods at Feria Artesanal San Pedro de Atacama, then see the interesting displays at Father Le Paige Museum, and finally see the interesting displays at Museo del Meteorito. To find traveler tips, other places to visit, maps, and tourist information, go to the San Pedro de Atacama travel route planner . Sao Paulo, Brazil to San Pedro de Atacama is an approximately 12.5-hour combination of bus, flight, and shuttle. You can also do a combination of bus and flight; or drive. The time zone changes from Brasilia Time to Chile Time, which is usually a -1 hour difference. Traveling from Sao Paulo in October, you can expect nighttime temperatures to be cooler in San Pedro de Atacama, with lows of 3°C. Wrap up your sightseeing on the 8th (Tue) to allow time to travel to Iquique. Thanks to the city's position on the Pacific coast, vacations in Iquique appeal to beachgoers, paragliders, bodyboarders, nature lovers, photographers, and fans of picture-perfect sunsets. 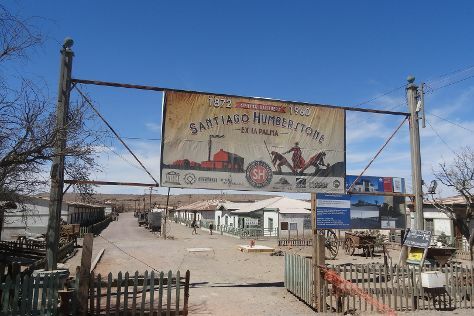 Start off your visit on the 9th (Wed): learn about all things military at Museo Corbeta Esmeralda, savor the flavors at Fabrica de Chumbeques M.Koo, then kick back and relax at Playa Cavancha, and finally see a world frozen in time at Oficina Salitrera Santiago Humberstone. To find traveler tips, where to stay, maps, and more tourist information, read Iquique trip planner. You can take a bus from San Pedro de Atacama to Iquique in 6.5 hours. Other options are to drive; or take a bus. Finish your sightseeing early on the 9th (Wed) to allow enough time to travel to Hanga Roa. Start off your visit on the 10th (Thu): steep yourself in history at Orongo, make a trip to Ahu Riata, explore the ancient world of Ahu Tongariki, then take in the architecture and atmosphere at Church of Rapa Nui, and finally contemplate the long history of Ahu Tahai. Get ready for a full day of sightseeing on the next day: explore the striking landscape of Rapa Nui National Park. To find more things to do, photos, other places to visit, and more tourist information, read Hanga Roa tour planning site . Do a combination of shuttle and flight from Iquique to Hanga Roa in 12.5 hours. Traveling from Iquique to Hanga Roa, you'll gain 2 hours due to the time zone difference. Expect a daytime high around 25°C in October, and nighttime lows around 19°C. Wrap up your sightseeing on the 11th (Fri) early enough to travel to Santa Cruz. The Chilean city of Santa Cruz offers a view into the country's agricultural and pastoral heritage, with well-preserved colonial-era traditions and architecture. On the 12th (Sat), learn about winemaking at Clos Apalta Lapostolle, learn about winemaking at MontGras, and then see the interesting displays at Colchagua Museum. For photos, traveler tips, ratings, and tourist information, use the Santa Cruz travel route planning site . Do a combination of flight, train, and bus from Hanga Roa to Santa Cruz in 11.5 hours. You'll lose 2 hours traveling from Hanga Roa to Santa Cruz due to the time zone difference. Traveling from Hanga Roa in October, you can expect nighttime temperatures to be a bit cooler in Santa Cruz, with lows of 9°C. Finish your sightseeing early on the 12th (Sat) so you can drive to Santiago. Start off your visit on the 13th (Sun): take in panoramic vistas at Sky Costanera, buy something for everyone on your list at Costanera Center, then take in the awesome beauty at San Cristóbal Hill, and finally examine the collection at La Chascona. On the next day, explore the galleries of Centro Cultural Palacio de la Moneda y Plaza de la Ciudadania, make a trip to Santa Lucia Hill, and then browse the eclectic array of goods at Central Market (Mercado Central). To find where to stay, other places to visit, traveler tips, and tourist information, read Santiago route planner . Traveling by car from Santa Cruz to Santiago takes 2 hours. Alternatively, you can do a combination of bus and train; or take a bus. Finish your sightseeing early on the 14th (Mon) so you can travel back home.